Jonathan Franzen’s zeitgeist-straddling Freedom has arrived with such outsized fanfare—most notably the Time magazine “Great American Novelist” cover—that backlash was inevitable. The binge and purge cycle of praise and resentment went several rounds before Freedom was even available in bookstores. NPR’s Alan Cheuse declared that the novel was “quite unappealing.” The New York Times trumpeted it as “a masterpiece.” I think I’ll go with compulsively readable, deeply felt, and often very, very funny. Like The Corrections before it, Freedom mines the psychology and behavior of an American family with the kind of acute detailing that elicits continual shocks of recognition. The characters are so intricately three-dimensional that they have the fullness and richness of close-up film acting, as if we’re witnessing dazzling Oscar-worthy performances. Franzen is fifty-one years old, roughly the respective ages of his psychically bruised married couple, Walter and Patty Berglund, at novel’s end. By which point—page 562 (a mere six pages shorter than The Corrections)—we feel deliriously and somewhat exhaustively connected not only to them but to their lovers, siblings, children, parents, neighbors and co-workers. The Berglunds meet while students at the University of Minnesota, Patty privileged from New York on a basketball scholarship, Walter of in-state modest background with political and policy wonk aspirations. Their college years are beautifully evoked, as is the secondary verging on primary character of Richard Katz, Walter’s roommate in school, and a charismatic rock musician whose life will stay entwined with Walter and Patty’s for decades to come. 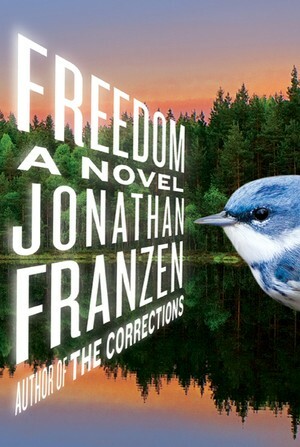 Franzen had to perform a lot of twisty pretzel logic to make the metaphoric locutions on the theme of “corrections” work throughout the earlier novel. Lots of authorial heavy lifting for little payoff, since it was hard to take much from the metaphor other than something ultimately really reductive, i.e., that death is the final “correction” to life. The theme of freedom, however, is infinitely malleable and wondrously adaptive to situations both personal and political, the borders of which are porous. As individuals, we, like Richard Katz, may invariably meet a moment of despondency when we contemplate suicide, a freedom allotted us as sentient beings. (“He was pretty sure that nobody would miss him much when he was dead. He could free Patty and Walter of the bother of him, free himself of the bother of being a bother.”) But just as Katz rejects the notion of suicide in favor of life in all its messiness and conflict, we feel that Franzen’s literary heart is moving in a similar direction, away from the chic dead-end despair of The Corrections, toward something enduring and good in the human spirit.